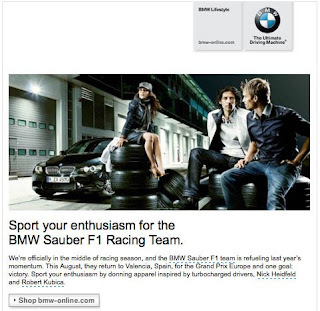 Almost two weeks after announcing they will leave Formula One, BMW Lifestyle’s email marketing group decided to promote the Sauber F1 Team's merchandise. So while they are no longer interested in supporting the team and they have a bunch of inventory to clear out, it’s time to get the fans to empty the warehouse. My favorite line in the email comes from the subject line: “Fuel Your Enthusiasm”, which should have been followed by “…Before Our Tank is Empty.” But the worst part of the email was the fact that BMW failed to give any price discounts on the products which obviously will go on fire sale mode in less than three months after the Formula One season comes to an end. So why is BMW leaving? "Premium will be increasingly defined in terms of sustainability and environmental compatibility. This is an area in which we want to remain in the lead… Our Formula 1 campaign is thus less a key promoter for us." Most feel it is more about disappointing results. The results of the Team have been poor as they have failed to win the world championship like Director Mario Theissen, who runs the Team, said they would do in three years. So it hasn’t been the best time for the Team, especially after an awful 2009 season. Mercedes has particularly made BMW look bad in the sport and so maybe BMW is just backing out under the guise of the move being a strategic refocus on environmental sustainability. Well you can’t really blame the BMW Lifestyle marketing team for trying to dump a bunch of product before the Team’s final season wraps up. Some discount would’ve been nice as I’m sure the Sauber Team fans all know the Team is dissolving soon.